For a full scale picture, please click on the picture shown ! 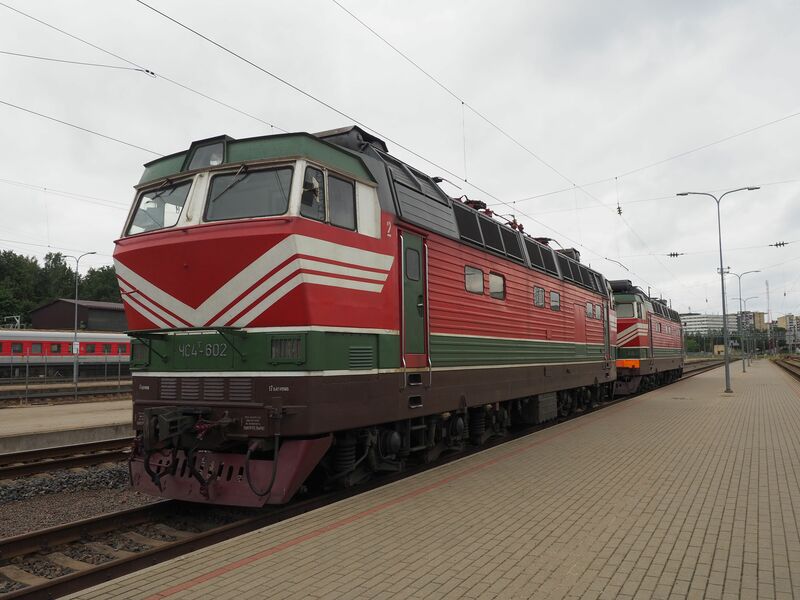 These were the first truly modern western passenger trains that Lithuania got after a long wait. 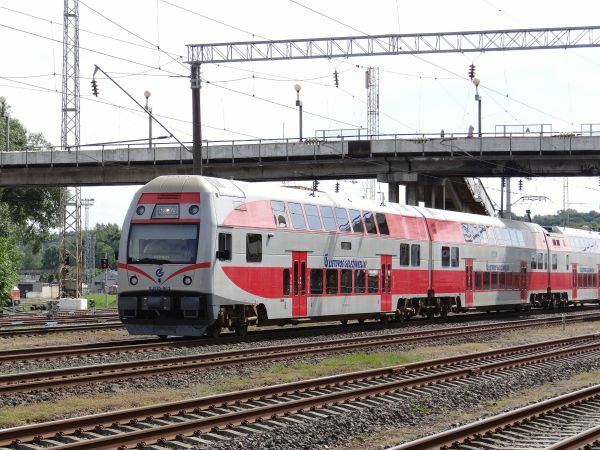 These are class EJ575 trains or better known as the "City Elephant" trains, built by Škoda Vagonka in the Czech republic. 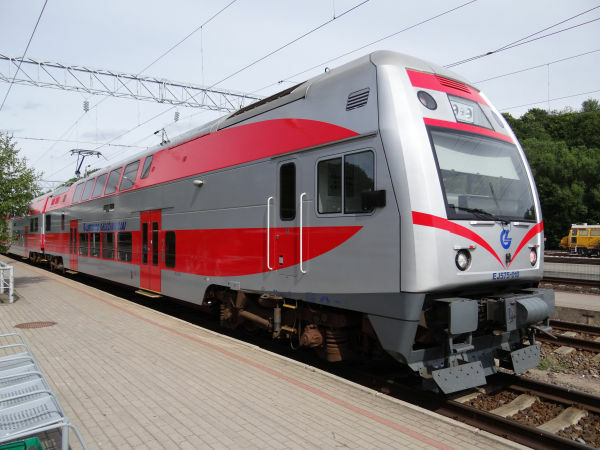 There are two and theree coach variants and the Lithuanian state railways LG uses these especially in the frequent services between the two most important cities Vilnius and Kaunas. Picture of a three coach CityElephant in Kaunas 26.6.2015 by Ilkka Siissalo. Another view of the same CityElephant. Picture in Kaunas 26.6.2015 by Ilkka Siissalo. Exactly the same place as in the two pictures above, even the same platform in Kaunas, but this time in winter. 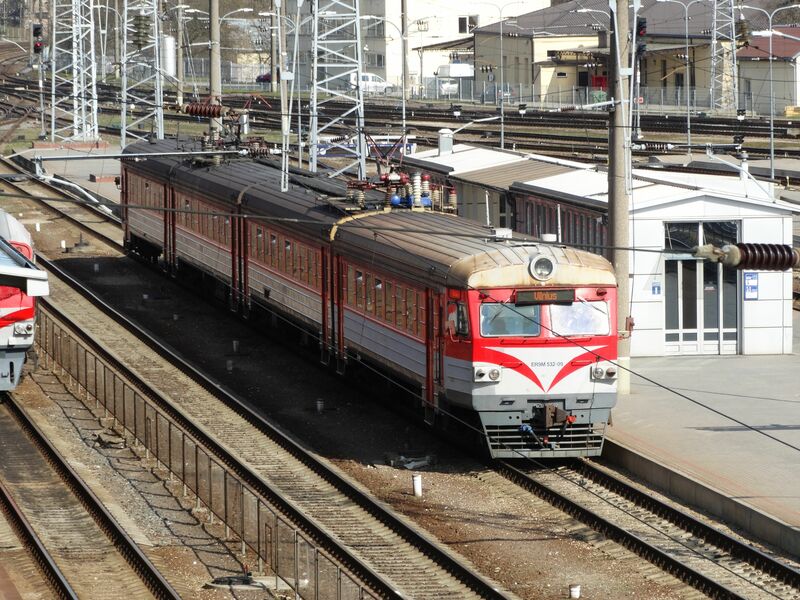 This class EJ575 three coach CityElephant is waiting at Kaunas station ready to leave towards Vilnius. Picture 29.12.2010 by Kyösti Isosaari. 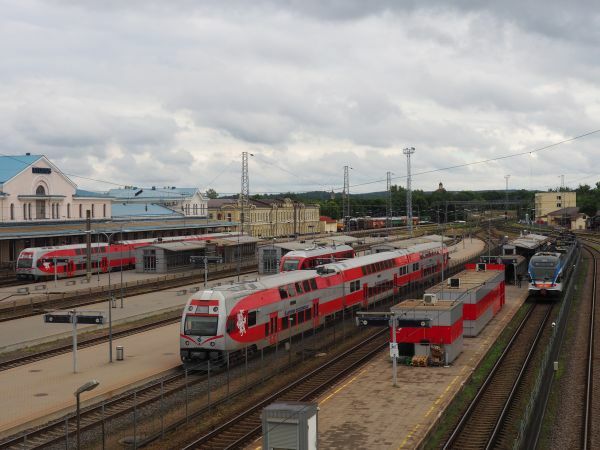 A two coach City Elephant of class EJ575 is arriving from Vilnius while a three coach variant is waiting on the left for its departure in Kaunas 26.6.2015. Picture by Ilkka Siissalo. 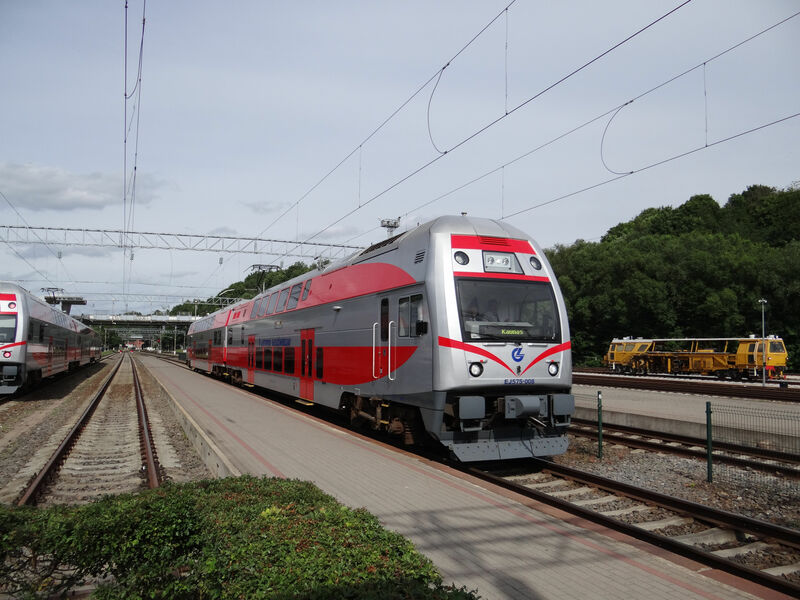 One of the three coach EJ575 City Elephant trains has just left Kaunas on its way to Vilnius. Kaunas 26.6.2015. Picture by Ilkka Siissalo. A three coach EJ575 City Elephant in Kaunas 14.5.2010 when they were brand new. Picture by Kyösti Isosaari. 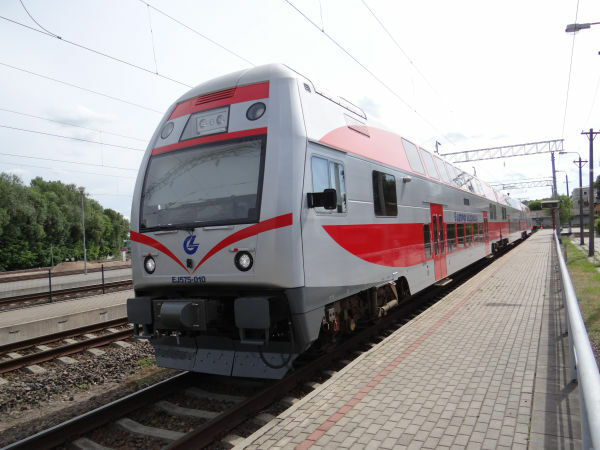 This is a class ER9M local commuter train of the Lithuanian state railways LG. 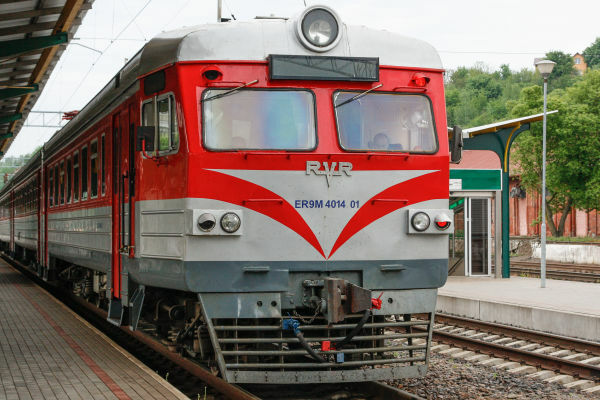 The class ER9M is a product of the company RVR, Rīgas Vagonbūves Rūpnīca in Latvia. 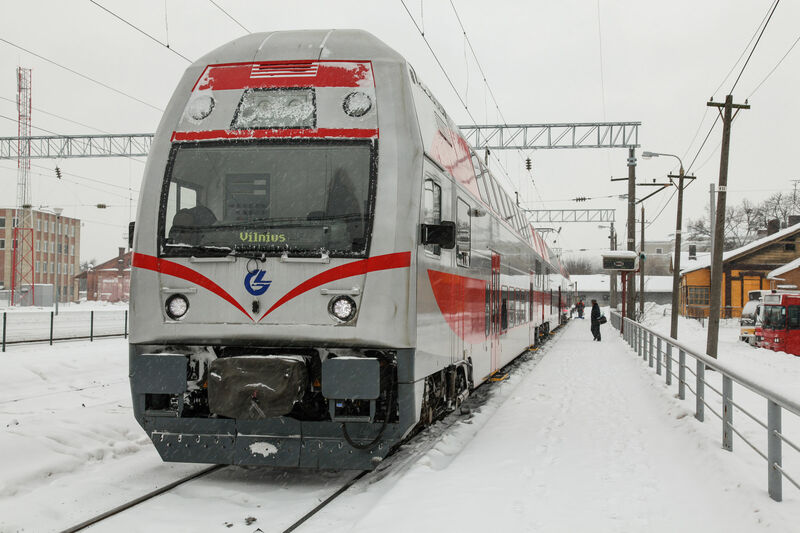 They are based on the older design ER2 which was common for example in the suburban traffic around Tallinn and Riga, but this model is designed for the 25 kV AC electric system. They were produced 1966-1975, this subtype M since 1976. Since the original type, this subtype had just the main differences that it had soft instead of wooden benches for the passengers and a separate high voltage compartment in their motorised cars so that the high voltage parts were better insulated. Later these trains have been just mildly modernised, having now better chairs and electronic displays for showing the destination of the journey. Picture from Vilnius 2.4.2017 by Ilkka Siissalo. 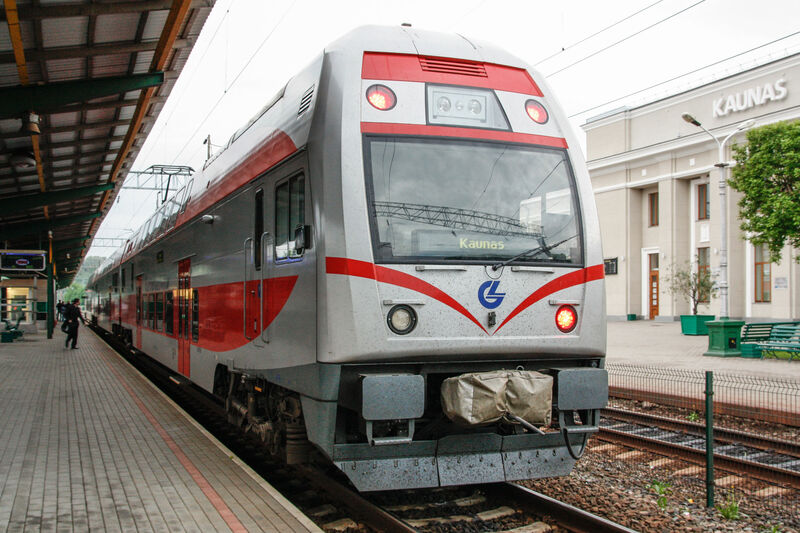 Another class ER9M electric multiple unit. Picture 14.05.2010 in Kaunas by Kyösti Isosaari. 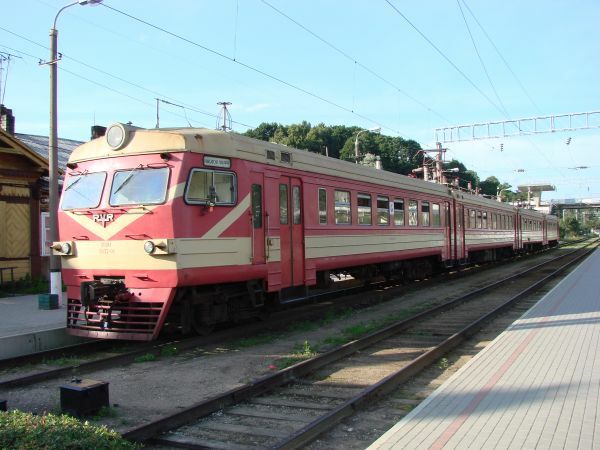 This is how the same ER9M trains looked like before any modernisations ten years earlier. Picture from Kaunas station 4.7.2007 by Ilkka Siissalo. A view of the station area of Kaunas. Note in the very right side corner of the picture a blue and grey train. That is a Belarusian Stadler FLIRT. The railway line between Kaunas and Misk got electrified and now the frequent traffic between these cities is handled no more by diesel multiple units but with FLIRT electric multiple units and electric locomotive pulled express trains. Picture from Kaunas 26.6.2018 by Timo Varshukov. Two huge Belarusian electric locomotives of the type ChS4 superscript T in Kaunas. 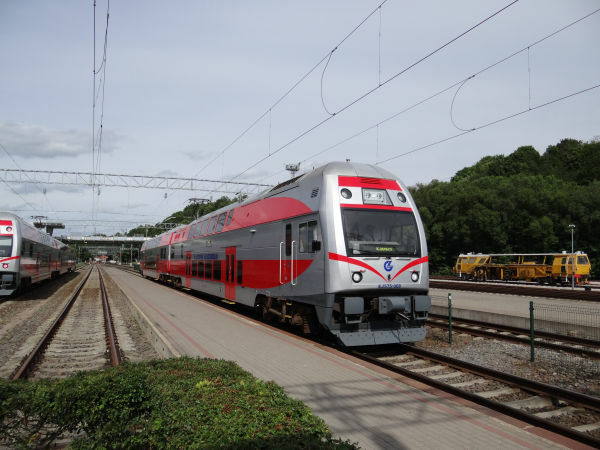 Since the Kaunas - Minsk line got electrified, heavy express trains have been pulled by these machines and no more by TEP70 diesels. The ChS4 T type is used by Russian and Belarusian state railways. They were built by Škoda in Czechoslovakia in 1971-186. Its top speed is 180 km/h, power rating is (only) 5100kW and it can only operate on 25 kV AC.